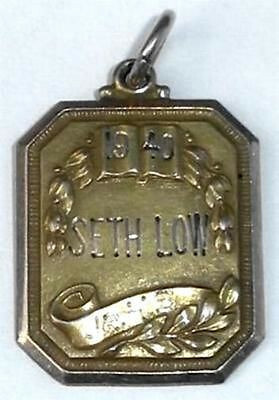 This is a 1940 vintage Art Deco 10K gold filled Seth Low Jr HSBrooklyn, NYC pendant, fob or charm. Marked 1/10th 10K gold filled with the maker's mark, Disanza Bro. Size is 1 1/4" tall with the bale by 13/16" wide. The front has beautiful Art Deco beveled edges with deep recesses and a raised Victorian wreath and scroll design. Better than photo and nicely made with crisp detail. Weight is 5.6 grams. Nice estate oldie for your collection. 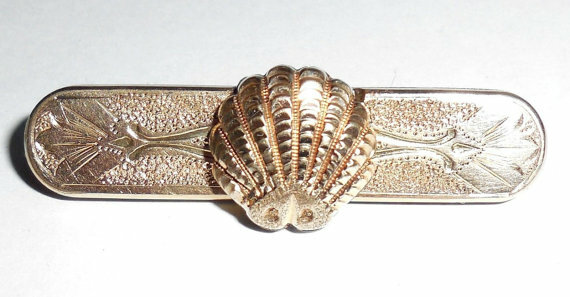 From an estate and needs to be polished out.....This is an Art Deco Victorian Etruscan revival gold plated/filled pin. It has a lot of very deep, dark patina from age and some age spots in the metal. Size is 1 1/2" long by 1" tall. It has Etruscan design, raised hand applied work on the front and is made the old way in 2 separate pieces; front and back with a large hollow space in the center so it is very antique looking and feeling. Depth is 1/8" from the top down to the flat back not including the pinback. No dents or dings or repairs. It is also very strong and very well made. A nice old estate addition for your collection. This is a gorgeous antique Art Nouveau to Art Deco 1920s-1930s Clark , Coombs 1/30th 14K RGP, Faux Opal and Paste ring in the best condition. Rarely used. No damage or repair. No wear to the heavy 14K rolled gold. No damage to the stones. All of the fancy ornate work is still deeply recessed, crisp and clear. 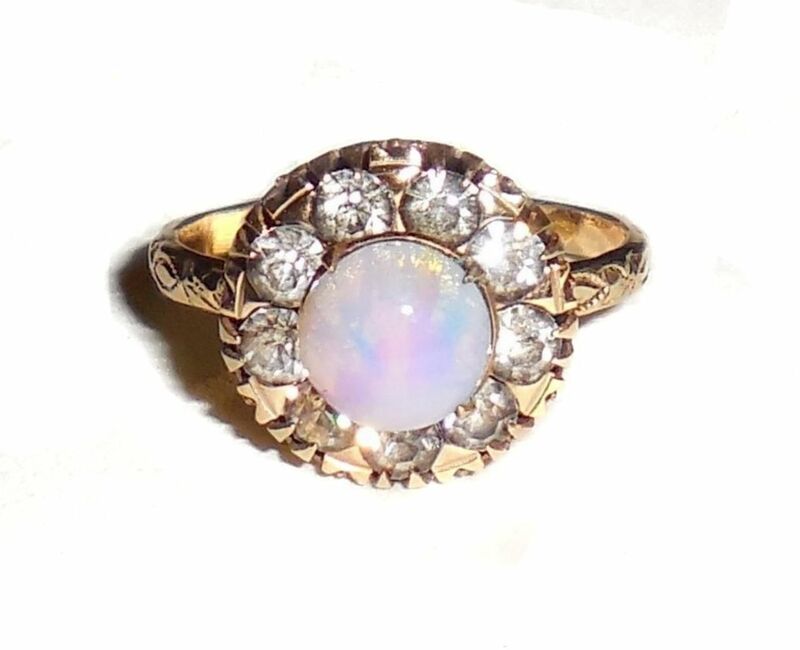 The faux opal has beautiful colors and the setting is very ornate. Size is 4.75 to 5. Light weight and delicate this is a gorgeous estate find in great original condition for your antique jewelry collection. 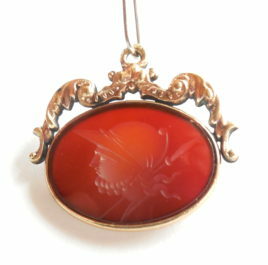 This is a lovely late Victorian to early Edwardian antique gold filled or gold plated carved carnelian watch fob for pocket watch or pendant for a fob necklace. It is from an estate and in original, never altered, excellent condition. The top has beautiful Victorian repousse and scroll border and the original top loop is still intact. The original frame is also excellent condition and has no wear, looks like antique gold filled. The top fancy border has minimal wear; a little at the very edge that is not eye noticeable. There is dark age patina in the grooves under the top which has not been polished. The carved carnelian is also excellent. No cracks or chips or flakes. No abrasions or scratches. Lovely old translucense. See photos. Size is large at 1.25" across east to west by 1.18" north to south including the small top loop. Great size for an antique fob necklace or dangling pendant necklace. Weight is 4.9 grams. The carnelian is 25mm east to west by 16mm north to south. 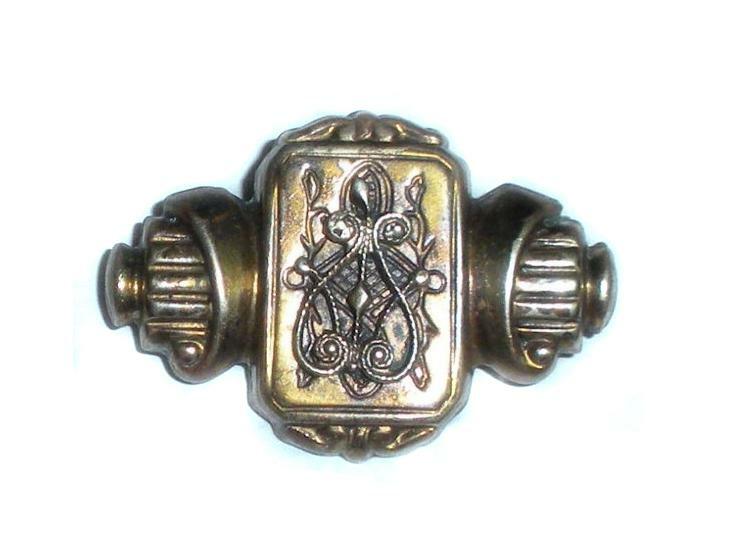 In all original condition this is a beautiful fob for your antique Victorian jewelry collection. Antique Edwardian dated 1909 brass wrap around stickpin with a beautiful large citrine or early synthetic stone. Marked Pat AUG17,09 Gold On RESD. Size is 2 11/16" tall. The top is 7/8" long across the wrap by 7/16" wide. The stone looks natural but could be a very good early synthetic. It has lovely golden amber color and internal fissures rather than bubbles which would indicate glass. Hand jeweled, bezel set and open backed. 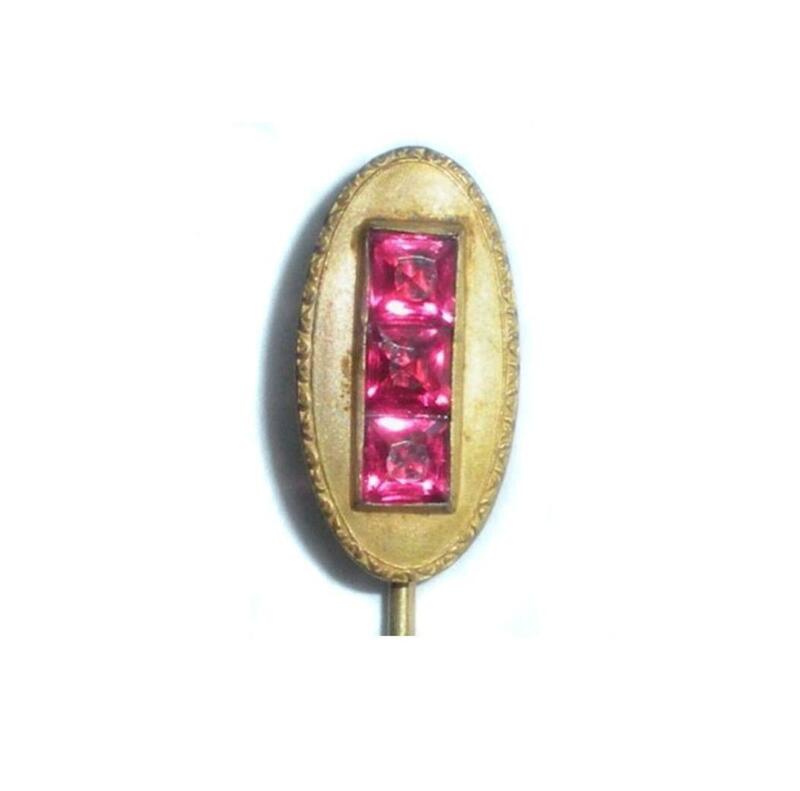 Beautiful early showy stickpin for your collection. 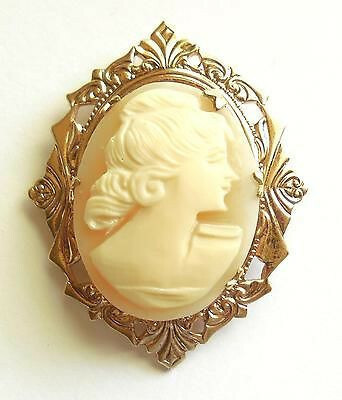 This is an antique gold gilt and carved shell cameo estate pin. She has a fancy frame and lovely facial features with curled hair, an intaglio eye, small straight nose and small closed lips. Size is 1 9/16" by 1 1/4" or 40mm by 32mm. The cameo alone is 1" by 3/4". For restoration or repurpose this is a lovely antique cameo for your collection. This is an antique Victorian hand made brass and micromosaic and black enamel stickpin. It has Victorian Etruscan ball edges. The head has Victorian crafting made of separate parts which are hand applied and then hand soldered. Size is 2 9/16" tall. The head is 5/8" across. Condition is original, gently used. All mosaic intact. 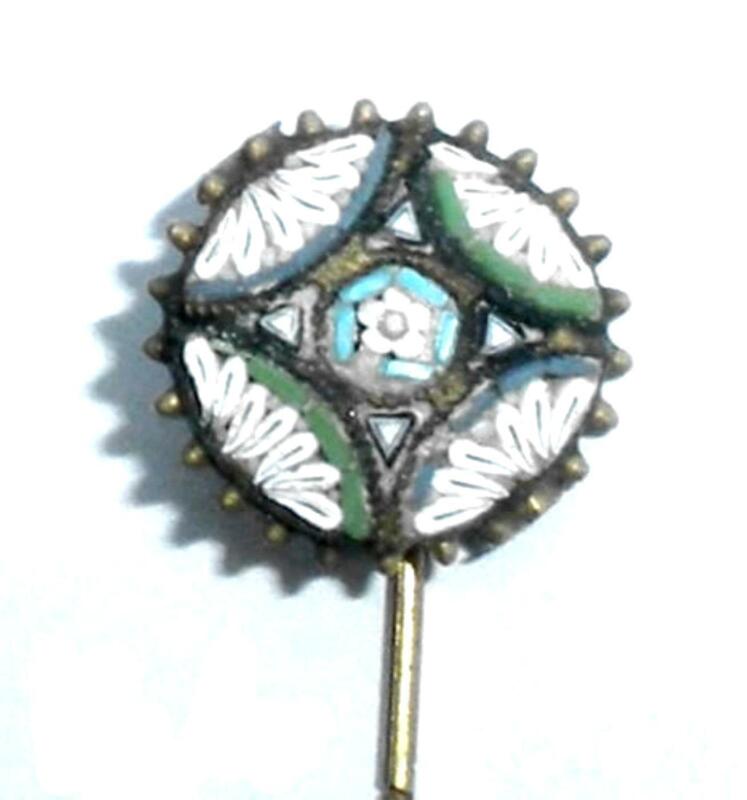 This is a beautiful early micromosaic stickpin for your collection. This is a gorgeous, small, antique Victorian, fancy taille d epargne chemise, petticoat, camisole or lingerie pin with a fancy triple monogram. The original Victorian C-clasp is still intact on the back. Size is 1" by 5/16". The gold front is very pretty with deep engraved work and fancy scroll. Other than a little age wear which can be touched up it is in excellent condition. No dents or dings. The ornate deep carved engraved work in the front is still deeply recessed and crisp - not worn down. 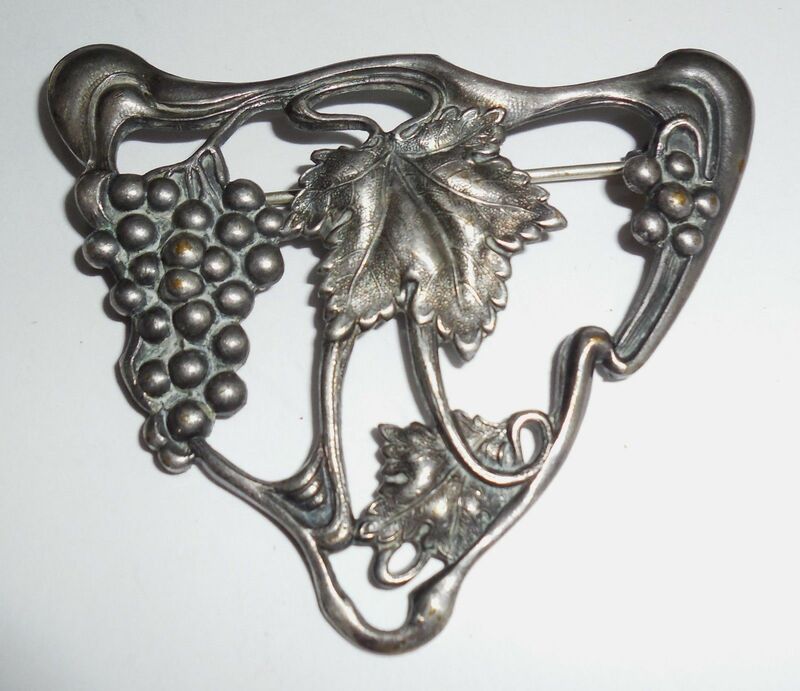 This is a gorgeous little Victorian lingerie pin for your antique jewelry collection. This is an antique Art Nouveau 1918 World War 1 brass bowling pendant or pin, mens or womens, in excellent condition. 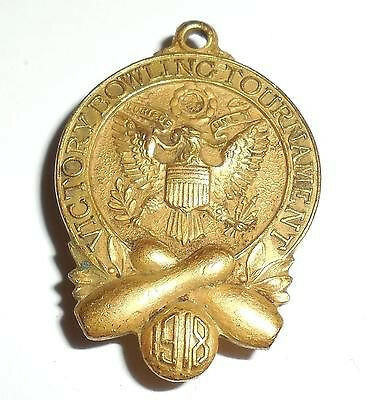 The front reads: "Victory Bowling Tounament, 1918" and the back reads "For The Boys Over There." Size is 1 1/4" tall North to South with the bail by 7/8" wide East to West. You can either add a chain to wear as a drop necklace or use it as a pin. This is a lovely nostalgic World War 1 antique jewelry addition for your collection. This is an antique Victorian to Art Nouveau gold filled, long, fancy etched, aesthetic period lingerie, chemise, petticoat , lingerie, blouse, dress pin. It has ornate deep engraved work on a fancy textured gold background. The photo is magnified and the jeweler testing notch you see in the back is actually very, very small....Other than this it is in excellent condition. All of the gold is intact and it has a lovely antique aged patina. 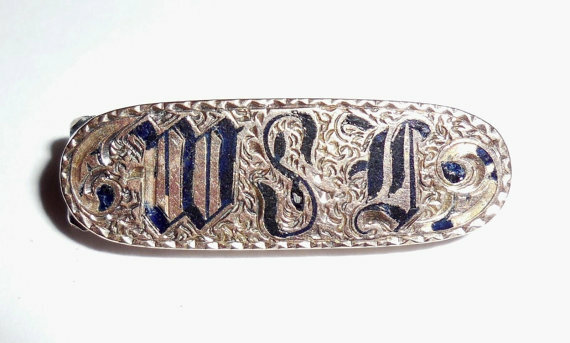 The original Victorian C-clasp is still present. Size is 1 5/8" long by 1/2" wide in the center. Weight is 4.2 grams. 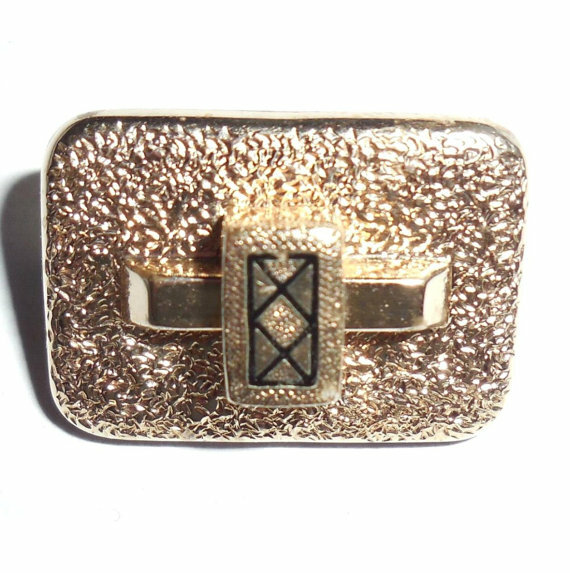 This is a beautiful aesthetic movement pin for your antique jewelry collection. Estate Find! Antique Victorian 1880s dangle watch pin or chatelaine in original condition. Please view photos and read product description below for more information! 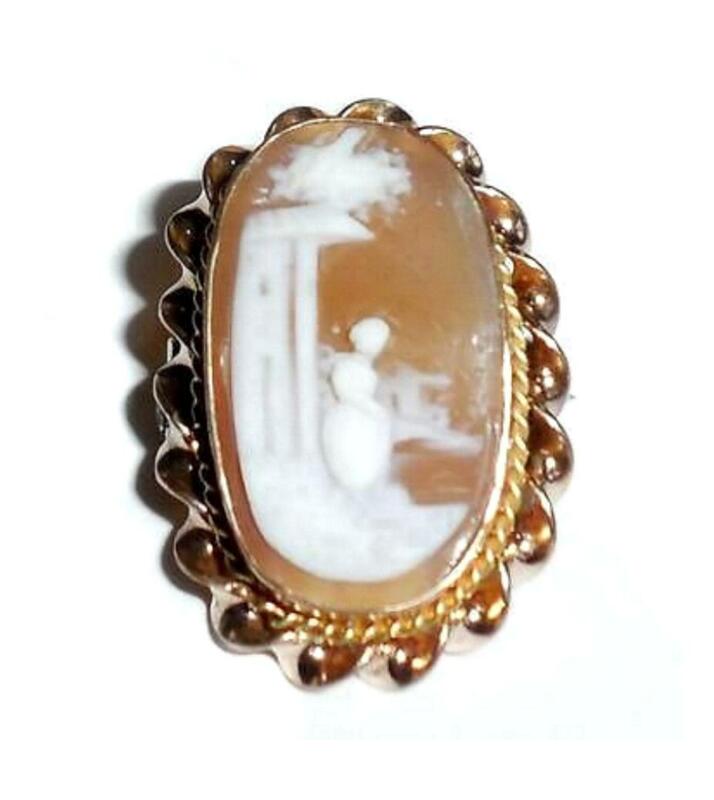 This is a lovely antique Victorian yellow gold filled natural carved scenic shell cameo pin in original, excellent condition. Original C clasp is intact and secure. No wear to the gold. No tears, deep scratches or dents. The front has crisp, clear detail of a lady in noticeable Victorian costume on a cliff with a bridge and water in the background. There are light surface age scratches on the back of the cameo but no open cracks, chips, or flakes. Size is 1" tall North to South 5/8" wide across. The unusual subject makes this a beautiful addition for your antique Victorian jewelry or cameo collection. Antique Victorian Gold Filled Stickpin Group Of 3 with Original Box This is a group of 3 antique late Victorian and Edwardian gold filled stickpins in an original box and in excellent condition. Respectively, they measure 2 5/16″, 2″ and 2 1/4″. There is an enameled star, a faux pearl criss-cross top and a Victorian love knot top. The love knot has dark black age tarnish/patina that has not been cleaned off. Overall condition is excellent. All gold is intact. NO GOLD WEAR. They came from an estate in an original box which has a sleeve to hold more than one pin. The box also has its original Victorian paper covering that is a little faded and worn on the sides. Inside velvet is original and is fine. 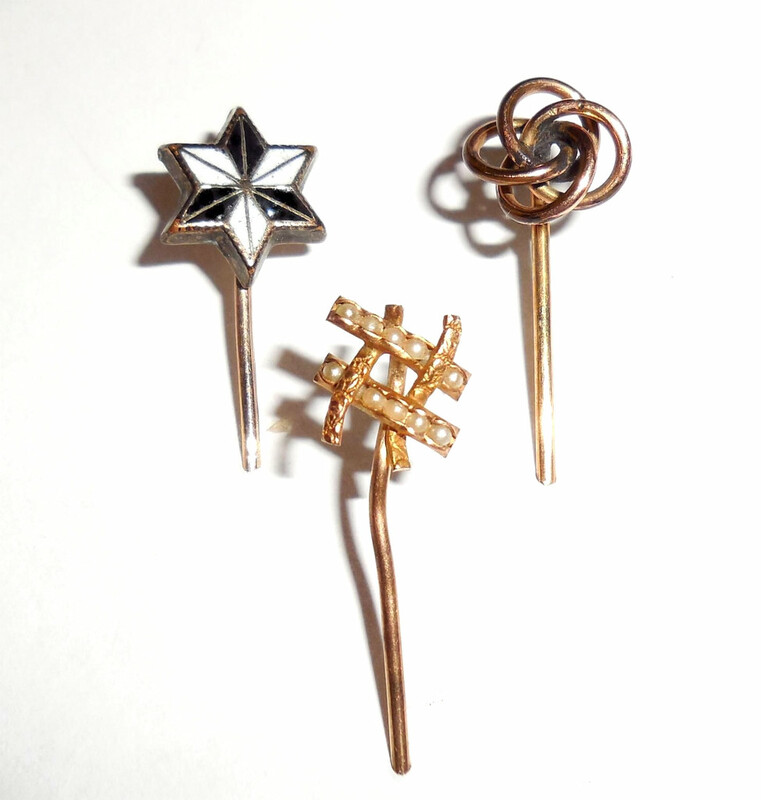 This is a lovely group of antique stickpins for your collection. This is a fancy antique late Victorian gold filled small Taille d Epargne pin for camisole, petticoat, lingerie, chemise or dress. Size is 7/8" by 5/8". The front is in gorgeous condition, bright and shiny like when it was originally made with a light age patina. The back has minor wear that could polish out. All gold is intact. 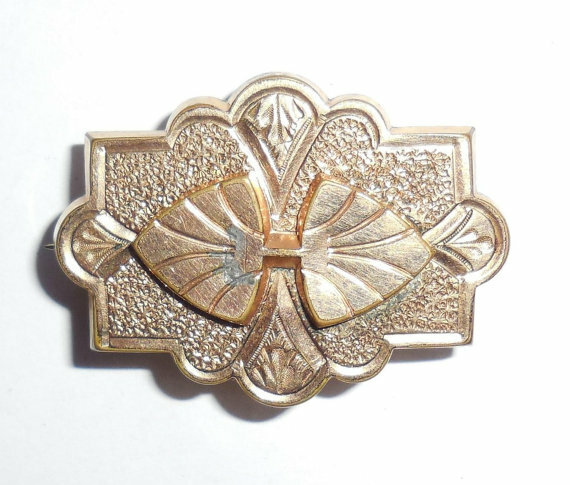 This is a lovely pin for your antique clothing or jewelry collection. 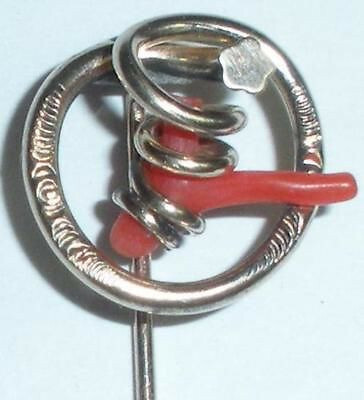 This is an antique Victorian gold filled stick pin or hat pin with natural red coral amid a graduated spiral coil. Size is 2 3/8". The head is just over 5/8" across. Condition is completely original and excellent. No wear to the gold filled. No repair. Lovely early addition for your antique stickpin or hatpin collection; the head is a nice size on this one.